We left homeport in Jamestown on day three bound for Salem, Massachusetts. Salem has been on my bucket list for a while, so I was particularly excited. There is just so much mystery, history and literature surrounding Salem and I have always wanted to experience it all for myself. Salem's founder, Roger Conant, first came to the area, known as Naumkeag, in 1626. Oddly enough, the settlement, which eventually became known for witch trials and executions, was renamed Salem after the Hebrew word for peace. Interestingly, the witch trials, the defining series of events which for which Salem became famous, lasted for just a bit more than a year. Today Salem embraces its history and has learned to make the most of it. Along with the very real history of the witch trials, Salem gives a wink and a nose twitch to more lighthearted witch stories. In the very heart of downtown, a statue of one of television's most beloved witches, Samantha Stephens, from the 1960's sitcom, Bewitched, welcomes visitors to the city. As soon as we parked and got out of our car, we noticed one shoe and a toboggan lying on the ground. Carter quipped that we better watch out, the witches were snatching people off the streets. We laughed and bravely headed in the direction of the real Witch House where many of the trials took place. Actually, there were supernatural forces at work in Salem, because before we could make it all the way to the Witch House, we were mysteriously drawn toward a store window filled with colorful macarons. It was literally beyond our control at this point and the next thing we knew, we were walking through the door of Caramel French Patisserie. Choosing from the rainbow of macarons in the display case was incredibly difficult. To make matters worse, we saw more cases filled with gorgeous confections and pastries. We thought the salted caramel macaron would be our favorite and it was delicious, but the almond one was even more scrumptious. We also sampled a confection called Le Caramel, which consisted of caramel mousse, almond meringue dacquoise and poached pears. It was just as tasty as it was beautiful. We could have stayed at Caramel French Patisserie all day, but we had to break the spell or we were never going to see Salem, so we left, wishing we had one of these shops closer to home. We finally managed to come out of our sugar coma long enough to get back on course to the Witch House. Now, you might think from the name that at least one of the so called witches lived here, but, no. The Witch House was the home of the witch trials judge, Jonathan Corwin. In 1675, Corwin finished the already partially built home and moved in. For its time, the home would have been a mansion. 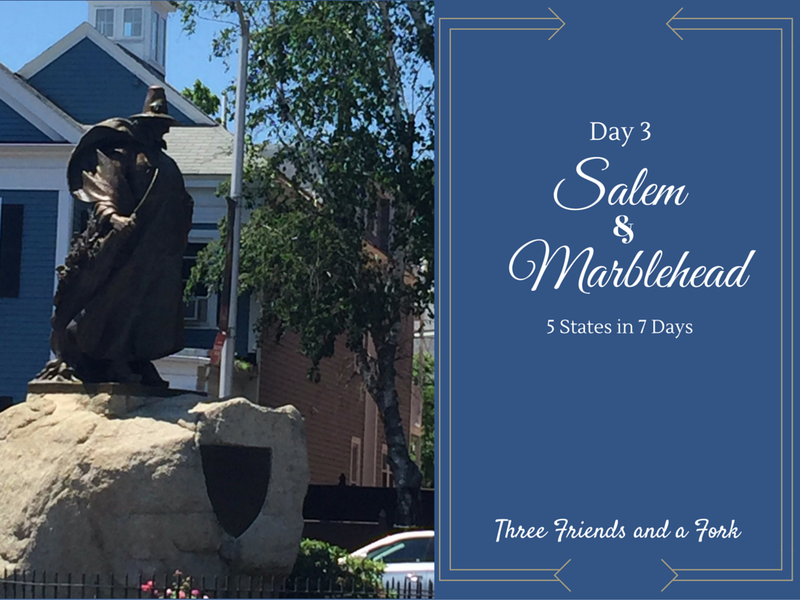 It is the only remaining structure with direct ties to the Salem witch trials. The dark gray exterior sets a perfect mood for the old stories of accusations, witches, and executions. More than anything, the house gives a glimpse of life in this country in the seventeenth century . The house is next door to First Church of Salem. While the current building was built in 1836, the church itself was started on August 6, 1629 when thirty settlers, including Salem's founder, Roger Conant and the first governor of the colony, John Endicott, gathered together to organize the church. The church also played a part in Salem witch trials when the nine year old daughter of Rev. Samuel Parris, Betty, was one of a group of girls who reported seeing visions and made accusations of witchcraft against members of the Salem community. Of the twenty people who were tried and executed, two, Giles Corey and Rebecca Nurse, were members of First Church. Judge Corwin's son, George, was later a minister of First Church of Salem. While the Jonathan Corwin Witch House is very old, it is definitely not the only old house in Salem. Everywhere you go in the city, there are historical buildings and houses. We enjoyed looking at all the beautiful old architecture. Of course, one of the most famous houses in Salem was one we could not miss, the Turner-Ingersoll house, otherwise known as The House of Seven Gables. The house was the believed to be the inspiration for Nathaniel Hawthorne's book of the same name. As the great great grandson of John Hathorne, the only judge of the Salem witch trials who never repented of his actions, Nathaniel Hawthorne was so disturbed by his ancestor's lack of remorse that he changed the spelling of his last name to disassociate himself. The House of Seven Gables has the same dark exterior as the Salem Witch House, which fits in perfectly with the gloomy writing of Nathaniel Hawthorne. We opted not to tour the inside of the house, choosing, instead, to walk around outside and enjoy the other old houses in the neighborhood. The house is just a few steps away from Salem Harbor. Salem is so full of old homes, you really do feel as if you are traveling back in time. While many of the old houses sport the same gray wood exterior as the House of Seven Gables, right across the street sits this cheerful yellow home. Right across the parking lot of the Seven Gables House is Ye Olde Pepper Candy Companie, billed as America's oldest candy company. Inside it is filled with sweets and confections of all kinds. The bright blue mushroom tops of this old Greek church caught our eyes, too. After our tour of Salem, we decided to take the short drive to Marblehead. We went straight to Chandler Hovey Park where the Marblehead Lighthouse sits on s rocky point jutting out into the harbor. The lighthouse itself is described as "skeletal" and for good reason. It is strictly a "bones only" construction. Once again, we were amazed at the beach chairs and beach umbrellas perched on the rocky promontory. There is no digging your toes into the sand here! Even so, the scenery was beautiful. All the picnickers at Marblehead reminded us that we had not eaten in a while, we headed back into Salem to grab a bite. While Dede and Carter looked for the local pizza place, I looked around for something else. What I found was a groovy little coffeehouse called Gulu Gulu Cafe. The name was enough to pique my interest, so I moseyed on in. Inside, Gulu Gulu was all high ceilings and brick with a large bar at one end. I was quickly seated and presented a menu. I ended up with a turkey sandwich called the Barcelona. It was grilled with arugula, manchego, apple butter and dijon mustard and came with a side of crunchy chips and a dill pickle spear. The sandwich was big, so I ate half and had the other half wrapped to go. I so wanted to try one of the coffees called a Russell Stover which was flavored with chocolate and coconut, but it was so hot outside, I just couldn't make myself order a hot drink. On the way out, I passed by the restrooms and had to laugh. I will just let the door speak for itself! I caught back up with Dede and Carter and we pointed the car north, heading for Maine. We drove through New Hampshire and thought that poor New Hampshire got the worst deal when it came to coastal real estate of any of the states we visited. We saw lots of muddy, tarry looking coastline, but nothing that made us want to stop for a closer look. With only 18 miles of coastline, New Hampshire didn't get much in the way of quantity anyway, but the shores we saw didn't compare in quality either. Uninspired, we continued on to our Maine destination for the night, Kennebunk. We lucked up totally when we found this little motel called, Port Inn. It was new, clean, comfortable and the staff was great. If you are going to be visiting near Kennebunk, we wholeheartedly recommend this facility. We tucked ourselves in for the night, so we could be bright-eyed and bushy-tailed for day 4 of our adventure...Kennebunkport! 3 Hauntingly Good Yums UP to Caramel Patisserie and Gulu Gulu Cafe.